Southdown Motor Services was formed on the 2nd June 1915 with the coming together of four local operators; Brighton Hove & Preston United Omnibus Co. Ltd., Worthing Motor Services Ltd., Sussex Motor Road Car Co. Ltd., and the London & South Coast Haulage Co. Ltd. 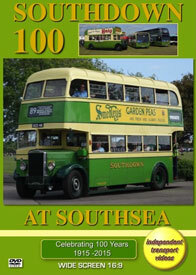 It is fitting that a special bus rally was organised on Southsea Common, near Portsmouth to celebrate 100 years of the Company on Sunday 7th June 2015. The independent transport videos cameras were on the Common bright and early to capture the event for you to enjoy. The vehicles began arriving from 8.30 on this bright and breezy morning. Of course the main stars of the day are those from Southdown that covered a period from 1915 to 1989 when the company was taken over by Stagecoach. This included Leyland Titans, Tigers, Leopards, Nationals, Atlanteans, Bristol REs, VRTs, a Guy Arab and a Volvo B10M. Newer vehicles from the current Stagecoach fleet were also represented, especially an Enviro E300 single decker in traditional Southdown apple green and cream livery and a double decker Enviro E400 representing the WW2 livery of green and grey. There was also a vast array of buses and coaches from other local and national fleets including Xelabus, Wilts & Dorset, London Transport, Royal Blue, East Kent - the list goes on! Our cameras capture nearly all of the arrivals and then take a brief visit around the common to see the vehicles in place. There were two bus services running on the day. Our cameras boarded National Bus Company liveried Leyland Atlantean 731 (SCD 731N) with a Park Royal body for the 100 service to the Hard bus station in Portsmouth. Here we are treated to the comings and goings of the preserved buses on this special ‘100’ service as well as the normal operations of Stagecoach and Firstbus running in and out of the bus station. For added interest Stagecoach were operating a ‘Rail Replacement Service’ using mostly fairly new E400 double deckers. We return to the Common on board traditional liveried Bristol VRT, 510 (UUF 110J) with an ECW body. We now take a look at the Southdown exhibits parked on the common, showing how much bus and coach design has changed in the last 100 years. To finish our celebration programme we position our cameras at the exit of the common and see the buses and coaches leaving for home, as they turn onto Eastern Parade in the late afternoon sunshine, which is surely the end of a perfect day!